The story of the Manila Cathedral is not only a story of the Church, it is also a story of Intramuros, a story of Manila, a story of the Philippines. 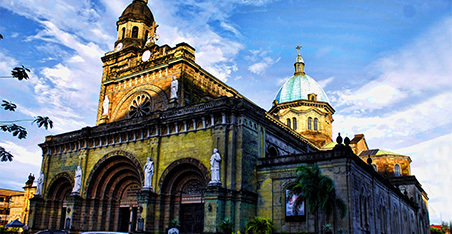 Manila Cathedral is a time narrative; it is about ruins and ravages, rising and restorations. As its pineapple finials powerfully symbolize, Manila Cathedral represents life cycle; its rich history is a reference to trails and timelines that call for a dynamic continuance. renovations and repairs of the church building and its appurtenant structures. The beauty of the present cathedral reflects details of architectural finesse and fidelity to its old form, to its glory and grandeur that have always been its distinguishing mark. But, perhaps, the present reconstructed, and now again renovated, Manila Cathedral will not fully capture the former splendor of the old one. Perhaps, only the memories of the past can evoke bittersweet remembrance of its olden magnificence. Yet, true to tradition, the Manila Cathedral has sprung back from the scratch, as always, and evolved far enough to reign in its rightful place in the history of the Church and of Manila, as a shining beacon and preserver of the faith in the heart of the Walled City – the homepage and centerfold of the Philippine history.